Ramallah / Gaza: During January and February 2018, Israeli Occupation Forces arrested 1319 Palestinians from the occupied Palestinian territories, including 274 children, 23 women and 4 journalists. These figures are drawn from a joint report for the months of January and February, which was issued by the Prisoners and Liberties Affairs Association, Palestinian Prisoner Club, Addameer Prisoner Support and Human Rights Association, and Al Mezan Center for Human Rights) on Tuesday. 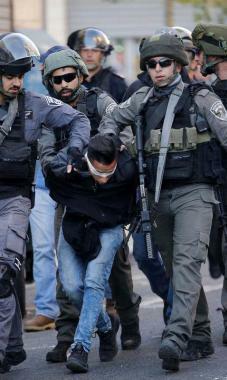 Those arrested included: 381 individuals from Jerusalem; 233 from Ramallah and Al Bireh governorate; 140 from Hebron governorate; 133 from Jenin; 118 from Bethlehem; 107 citizens from the governorate of Nablus; 59 from Tulkarm governorate; 54 from Qalqiliya governorate; 20 from Salfit; 21 from Jericho; and 30 from the Gaza Strip. The number of Palestinian prisoners and detainees in Israeli jails, as of February 28, 2018, was 6500. Of whom 63 were women, including 6 girls, and 350 were children. In regard to the policy of administrative detention, the occupation authorities issued 169 administrative orders since the beginning of the year, which includes including 52 new orders. At the end of the period, the total number of administrative detainees was 500. Additionally, the report highlights the cases of Yassin al-Saradih from Jericho and Ismael Abu Riala from Gaza. In these particular instances, the occupation authorities violated their right to life during their detention. According to the human rights institutions, the Israeli occupation forces have killed 213 detainees since 1967. The majority of these died as a result of torture, which amounted to 72. The report also drew attention to the issue of naked searches carried out by Israeli prison authorities. Several testimonies were submitted by detainees, which claimed that these searches violated their basic dignity. It also refers to violations against female prisoners in Israeli prisons, which have been documented through visits by human rights organizations. These violations include: the denial of medical treatment, which is especially pertinent as a number of them suffer from injuries and health problems, poor quality food, overcrowding in the places of detention, and physical and psychological abuse. The report stresses that the occupying state is committing grave and systematic violations of the rules of international law and international human rights law. It calls for the establishment of a fact-finding committee by the Human Rights Council on Israeli violations of detainees, and for the activation of international accountability mechanisms towards perpetrators. The human rights organizations also call on the High Contracting Parties to the Geneva Conventions to take up their responsibilities, and to pressure the occupying state to respect the rules of international humanitarian law and the rights of detainees.